One of my favorite places is Muir Woods in northern California. Walking through the giant Redwood forest is grounding; Mother Nature is in charge. The beauty of this forest is its richness in both the large and the small inhabitants. That old figurative expression can be applied quite literally here; it is easy to actually “miss the forest for the trees” in a place like this. The giant trees claim most of the attention and it would be easy to leave having enjoyed the trees, yet having missed the other inhabitants of this wonderful place. If one looks down, there is a lot of flora to discover, such as this bacon fungi and moss growing on the base of a tree trunk. 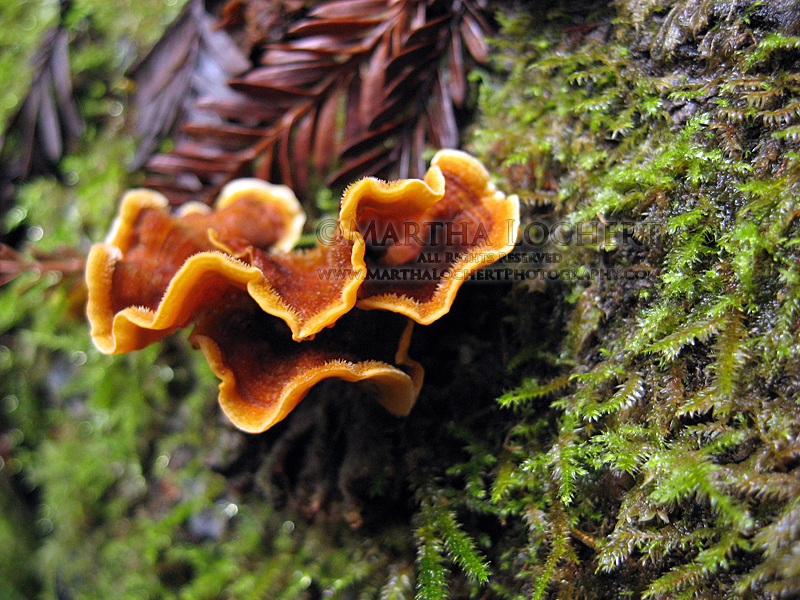 This entry was posted in color photography, Macro and tagged flora, fungi, macro photography, moss, Muir Woods. Bookmark the permalink. I recall your fondness for Muir. The photo is exquisite.